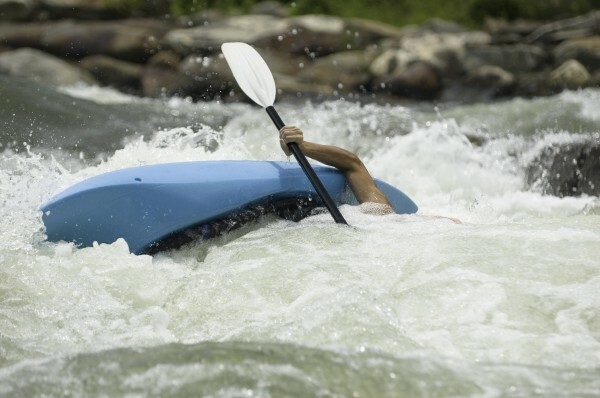 Our Beginner Kayak School is perfect for people who want to try whitewater kayaking for the first time - although there has been paddlers who returns for a second course to master the finer points. The course takes place over weekends, on the Vaal River near Parys in the Free State which is only 70km from Johannesburg, beginning early Saturday morning and finishing at 4or 5pm on the Sunday afternoon. Our instructors have a combined total of 36 years of kayaking experience and are registered with the APA. They have taught many people how to successfully paddle a river with the proper technique. Accommodation in the form of a camping spot with electricity and hot showers is provided on the banks of the river and included in the course price. All necessary equipment is provided so all you need to bring is sunscreen, a tent and a good sense of humor. The course focuses on getting you comfortable in your boat on the water, river reading and most important; having fun. On day one we start off in a swimming pool next to the river and practice falling out of the kayak and rolling. We then stop for a short lunch/rest and move on to practice on a flatish stretch of river. On the Sunday we paddle from the bridge just outside of Parys to Gatsien. This is a full day paddle with small (grade 1 -2) rapids and instruction/guiding from our instructors. You can check availability for courses on our calendar on the website - www.whitewatertraining.co.za or you can phone us for a booking. We can take up to 12 students at a time and discount for a Kayak Start-up Kit is available.